Cruise holidays present the opportunity to travel hundreds, potentially thousands of different itineraries all around the world. From the Bahamas and the Caribbean to Canada and New England, there are hundreds of cruise ship ports around the world just waiting to be explored. We know that our cruisers like to have unique and unforgettable travel experiences, which is why we’ve created this list to highlight 10 of the most unique cruise ports and destinations you may get to experience along your cruise. Klasvik is the second largest town in the Faroe Islands, which says a lot about how remote this region is, as the town is actually rather small by UK standards, having a population of around 5,000 residents. Klasvik cruise port is located between two inlets, framed by hills. The view as you cruise into Klasvik is remarkable as these perfectly sculpted hills loom either side of the ship. The first settlements of Klasvik date back to Viking times but it wasn’t until the 20th century that the area developed to form a modern town. There’s 3 different locations you might port at in this destination and one of them is the tiny village of Anir that has just 16 residents. Points of interest in this port include Pyramid Mountain which sits on the island of Kunoy. There’s also a chance for you to visit a traditional chemist complete with many original bottles containing all sorts of lotions and potions. There’s an excellent transport system in Klasvik with regular buses collecting guests from port and bringing them to the town centre. If you find yourself with plenty of time in Klasvik, you can also catch a bus to Torshavn which is a remarkably pretty cruise port in the Faroe Islands. In Torshavn you’ll find traditional clapboard houses painted in red with white timber window frames, a quaint fishing harbour and a scattering of shops and dining areas along the waterfront. Icy Strait Point is one of our favourite cruise ports here at Cruise Nation. It’s a purpose-built cruise port and as a result it has excellent facilities for guests who visit there. Due to the pre-planned nature of the port, it means that there’s been time to consider the impacts that the port will have on the environment, economy and culture of the region. Today Icy Strait Point remains uncommercialised and they allow only a limited number of cruise ships into port each year from only a handful of cruise lines. The locals of Icy Strait Point have been empowered to demonstrate and share their culture with the visitors to Icy Strait Point. From the buildings which were built by Tlingit craftsman to the handmade gifts like preserves and hand carved statues – it’s all authentic. For the ultimate view of this port, make sure to get yourself on the ZipRider which is the world’s largest zip line! It’s 5,330 feet long, has a 1,300 foot vertical drop, a maximum speed of 60 mph and the highest point from the ground is 300 feet… plus did we mention the ride time is 1 a minute and half – quite a long time considering the speed you’ll be soaring over the tree tops! Proclaimed as one of the New Seven Wonders of Nature, Komodo Island National Park is home to the biggest and heaviest lizard in the world -the Komodo Dragon. Discovered over 100 years ago by Dutch sailors who reported sightings of creatures reaching 10 feet in length and weighing over 300 pounds, these fantastical creatures still freely roam the island today. Despite the dragons being the parks biggest draw for visitors, there’s also an incredibly diverse marine habitat here which is home to over 1,000 species of fish, 260 species of reef building coral and an array of sharks, dolphins, sea turtles and whales too. As well as being a National Park, Komodo Island is also listed as a UNESCO World Heritage Site and a Man and Biosphere Reserve. Due to Komodo Island’s fragile ecosystem and in order to preserve it, cruise visitors may only depart the ship in this port if they are part of an organised tour. As well as the incredible wildlife that can be spotted on Komodo Island and its spectacular green hills and mountains, another impressive point of interest here is the enchanting Pink Beach which is one of only seven pink beaches in the world! The amazing pink sand of the beach has been built up from crushed red coral – quite the sight to behold! Also referred to as Le Port Reunion or sometimes just Réunion, this island is located in the Indian Ocean to the east of Madagascar and 109 miles southwest of Mauritius which is its nearest neighbouring island. Réunion is an insular region of France and although it may look relatively small and remote, it’s been inhabited since the 17th century and today it has a population of over 800,000. Although the official language of Réunion is French, the most spoken language is Réunion Creole which is derived mainly from French but also includes terms from a selection of other languages such as Hindi, Tamil and Portuguese. Réunion is an island of incredible beauty both inland and offshore. It’s a UNESCO World Heritage site and National Park. It’s nearby waters are home to an array of marine wildlife such as conger eels, parrot fish, sea turtles and emperor angelfish. There’s also a significant shark population around the waters of Réunion, which is why surfing, body boarding and swimming have been banned around half of the coast since 2013. On the other end of the scale from sharks, the inland wildlife is significantly smaller with the largest land animal being the panther chameleon which typically around 17 inches in length. If you’re a wildlife enthusiast this is most certainly a destination to put on your wishlist! Cruising to Geiranger makes you feel a little like you’ve discovered an innermost hidden nook of the world. The journey to port offers you the most astounding views as the UNESCO World Heritage-protected Geirangerfjord is lined by majestic mountains and tumbling waterfalls on either side. There’s something about this landscape that feels a little fairy-tale like too, perhaps that’s due to the fact there are so few man-made structures, after all the port is just a tiny village which you can walk the length of in around 5 minutes. Whilst the village may be small, there’s some great excursions that lead out of Geiranger including kayaking along the waterways, helicopter rides for a birds eye view of the fjords and hiking tours to some of the best viewpoints like Eagle’s Bend or Dalsnibba. Whilst Grand Cayman has many of the typical offerings you come to expect with Caribbean cruise ports such as duty free shops selling jewellery and alcohol, there’s also some particularly special experiences to be had here, like sending a post card from Hell for example. Hell is actually a jagged limestone rock formation which we have to admit does look a tad formidable. There’s several explanations as to how this place earned it’s name, some say it’s because ‘this is what hell must look like’, whilst others argue it’s because when you throw a pebble and it lands in the cracks, it sounds like the pebble is falling all the way down to hell. The post office here is bright red and yellow, so you can’t miss it and even if you’re not typically one for sending postcards, you might find that the kitschy phrases and pictures are enough to put a smile on your face and tempt you to do so for the amusement of friends and family back home. 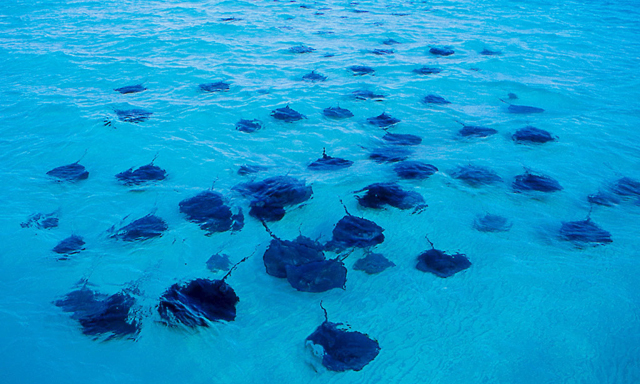 Of course we couldn’t talk about Grand Cayman and not mention Stingray City. It’s THE place in the Caribbean to experience Stingrays as dozens of these unusual creatures flock here daily for feeding. There’s numerous tendors who take guests on excursions here so keep an eye out for the best price – but be aware that this is a busy cruise port and excursions can sell out so booking in advance in advisable. Also in Grand Cayman you’ll find the Cayman Turtle Farm which is a conservation and research centre where visitors can go to learn more about these beautiful animals. Not only can you swim with turtles here but you can also experience other wildlife such as exotic birds, crocodiles, sharks and barracuda. Once you’re done exploring, take advantage of the iconic Caribbean beaches of Grand Cayman, whether it’s Seven Mile beach or Cayman Kai or Rum Point. Whilst Milford Sound isn’t really a port of call, it’s a highlight of any cruise through this part of the world. Make sure you’re up on top deck as you glide through these waterways with snow-capped mountains that loom out of the water. Milford Sound is the crowning gem in the Fiordland National Park which is part of Te Wahipounamu World Heritage site in New Zealand. The steep cliffs lining the waters edge are covered with a lush green rainforest and the tallest peak (Mitre Peak) stands 1,692 metres above sea level, which is quite a sight to behold! Whilst being predominantly an area of natural beauty, Milford Sound also has a fascinating involvement in Maori legend and it’s said that the rugged landscape was created by Tu-te-raki-whanoa (a godly figure) who was tasked with shaping the Fiordland. Further to this it’s also written that a long-extinct native bird call the Piopio flew to Milford Sound in mourning when the legendary hero Maui died whilst fighting to win immortality for his people. Although the Maori people were said to have discovered the Sound over 1,000 years ago, in 1912 a European native called John Grono settled here and named the Sound after Milford Haven in Pembrokeshire, Wales. The picturesque Bay of Islands is similar to Milford Sound in that it’s not a port of call – but it is one of the highlights of a cruise itinerary in New Zealand. 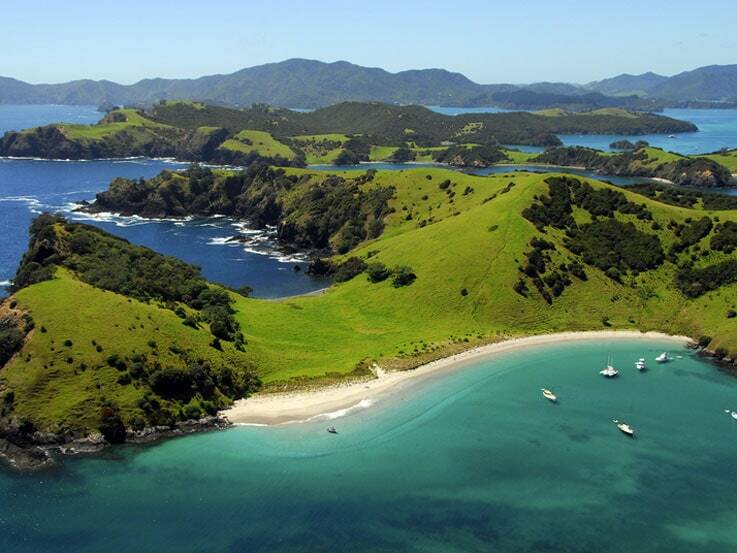 The Bay of Islands is one of the most popular fishing and sailing destinations in New Zealand and it’s particularly renowned for big game fishing. Made up of 144 islands, this cluster has a cornicopia of hidden coves, beaches and inlets and the best way to appreciate the beauty of many of them is as you cruise past from the height of your ship. Even from the point of approach, you can tell that Cape Town is a unique cruise port. The contemporary structure of the circular stadium stands out in field of green and Table Mountain rises proudly in the centre of the city which has sprung up around it. To appreciate the size and beauty of this city, a visit to the top of Table Mountain is a must and thankfully there’s a cable car to take you here which delivers astounding views on the journey there and back. Whilst in the city be sure to visit Martin Melck house. It’s one of the oldest colonial homes in South Africa and it currently houses a fascinating exhibition on the life and work of Nelson Mandela. Wildlife enthusiasts will cherish a visit to Boulders beach which is a 1 hour car journey from the cruise port (but well worth it). This beach is scattered with giant granite boulders which are reported to be over 540-million years old and it feels somewhat alien to be on the beach surrounded by these giant rocks. Of course the other reason for visiting Boulder Beach and the nearby Foxy beach is to see the colony of African penguins which live there. These cute creatures wander the beach, boulders and water freely and you can watch in delight at their antics – certainly a travel memory to cherish! St Petersburg really is a cruise port quite like any other. Whilst it’s reputation for pickpockets might set your alarm bells ringing, there’s an unbelievable wealth of culture and history here that’s just waiting to be explored. One of the sights of the city which you’ll almost certainly recognise from it’s prominence in guide books and travel blogs, is the Church if the Saviour on Blood – an astounding feat of architectural design with it’s many opulent turrets and accents of blue, green and gold. This is just one of many impressive architectural wonders throughout the city, the Russian Museum and St Isaac’s Cathedral being others. One of the best times of year to visit St Petersburg is May to mid-June when the city experiences what is referred to as White Nights where the sun barely goes below the horizon. The season of White Nights is packed with festivals, concerts and celebrations as the locals take advantage of almost endless hours of daylight. If you do have the opportunity (it’s likely you will as most cruise ships dock overnight in St Petersburg) then a visit to the Mariinsky theatre for an evening of opera or world-class ballet is an experience you won’t find just about anywhere. Have you ever been to any of these cruise destinations? Let us know in the comments below or on Facebook and Twitter – we’d love to hear about your travels! Perhaps you’ve been to a cruise destinations which you think is far more unique than our selection here? If so we want to hear your thoughts about that too, so get involved and chat to us!